SCANDAL has booked another big-name guest star to recur on the series: former FRIENDS star Lisa Kudrow! An ABC rep has confirmed the casting, but there were no additional details available at this time. According to Deadline (who was first to report the casting), Kudrow will play a politician. Anyone else dying a bit over this? From remakes of old shows both on the big screen and small, to once again stealing from the Brits, to the return of an oldie but hottie – todays’ TV buzz proves the adage “everything old is new again”. But the question remains, is it better the second time around? Who will be the B Team Taking Over for THE A TEAM? 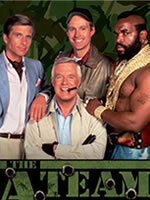 Fox has announced the creative team that will be helming the upcoming movie version of THE A-TEAM. Joe Carnahan will direct while Tony & Ridley Scott will produce. Stephen J. Cannell, who was the creator of the TV series, is also on board as a producer. The script by Skip Woods is being worked on by Carnaham and Brian Bloom (as in ‘I get lost…in your eyes‘ Brian Bloom, sigh). Are you ready for an A-TEAM movie? Can the magic of the TV show be captured on the big screen? Casting calls? Anyone come to mind that could play the legendary roles of John ‘Hannibal’ Smith, B.A. Baracus, Murdock, The Face? Will VERONICA MARS PI Her Way to the Big Screen? Speaking of the leap from the small screen to the big screen…I’ve been rather reticent about the rumors swirling around about the possible VERONICA MARS movie. I know everyone is all a flutter about it, but I’m not. Don’t get me wrong, I’m all for seeing my VM friends again. I was very disappointed in the ending of the show and I would enjoy the chance to have some closure with Veronica, Logan and the rest. But I don’t really buy that it’s going to happen. Yes Joel Silver wants it done, and yes Rob Thomas said he is going to pen it, but do I see it happening? Nope. I don’t believe for one second that a studio would back and distribute a film that had horrible TV ratings on the lowest rated network. Why would they do that? I understand that this worked for “Firefly”/”Serenity”, but that was a show that had the full support of the Whedonverse. I just can’t see the same turnout for VERONICA MARS. I would love nothing more than to be wrong on this one. Make it happen. But until I see a release date I’m not going to let myself get overly excited about this one. Would you like to see a VERONICA MARS movie? Who are the essential cast members that must return? Do you see this ever coming to life on the big screen?